Home / Ricetta / Spritz oil cocktail with white chocolate rim, green tabasco & appetizers. Spritz oil cocktail with white chocolate rim, green tabasco & appetizers. Extra virgin olive oil, Prosecco and tabasco? This may seem like a risk, but when there is skill and great taste the combination turns into pure pleasure. 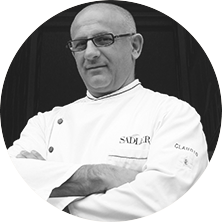 The creativity of Chef Sadler reaches new heights, transforming every kitchen into a cocktail bar. 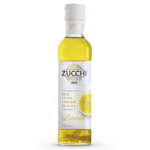 Pour the maltodextrin into a casserole dish, adding 100% Italian evo oil along with lemon-flavored olive oil and place on stovetop at very low heat, beating with a whisk to assure a soft, fluffy consistency. Melt the white chocolate and brush it with a cooking brush around the rim of the cocktail glass and dip it in the oil fluff so that it sticks, then store in a cool place. Drop a couple of ice cubes in each glass, add the Aperol, 2 drops of Green Tabasco, lime zest and Prosecco and mix with a swizzle stick. 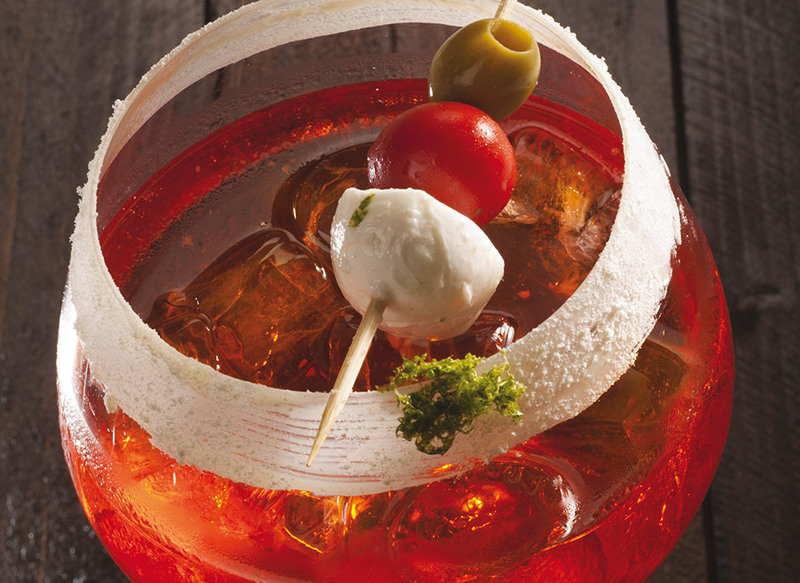 Compose the skewers with 1 cherry tomato, 1 olive, 1 cherry mozzarella and 1 basil leaf and place inside each glass before serving the Spritz.